My Weblog: Bugs and flowers, but no food. Bugs and flowers, but no food. Please note dear Husband, this is why you don't get any dinner some evenings - I'M BUSY ! you have been busy! those are all so wonderful! I love the quilt with the detail on the top band. that is such a wonderful idea! Ohhhhhh....so sweet! 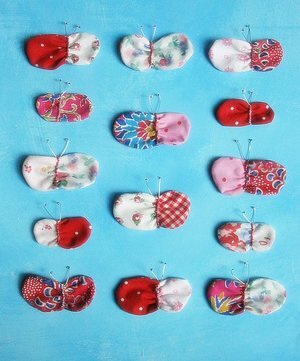 Bountiful bevvy of beautiful butterfly brooches, the embroidery on the quilt and the flower brooches. Please, do tell, how they are made. I love their look much more than other flower brooches. Not my idea Jenn, but Caroline Zoob's. Taken from her lovely book, Childhood Treasures. I love it all. Go on give us a hint or close up of the flowers. Just love the quilt and brooches. Glad I'm not alone when it comes to preparing meals! love it all! and i join the others in begging for a tutorial on the rocking flowers. pretty please?? Oh such pretty things! The butterfly's look so lovely all grouped together like that, and the quilt is adorable. Those flower pins are delightful - I really like the fabrics that you have chosen. So adorable! You choose the most yummy colors for your projects. I'm a sucker for red checks. Pretty please, let us in on how the fabric brooches are made. Beautiful work! I'd be tempted to have a picnic on the quilt...and wear all the brooches at once. Really sweet. Oh, they're all wonderful. The butterflies are my favorite. wow, that is GORGEOUS...beautiful! i love the colors...and the hand embroidery, that must have taken forever! love love love it!! I would love to be the flower for a while. I need the break. Love this fabric flower brooches,i want to do this on my own.My friend's mother always do sewing different design of bed sheet and everything. Any chance on a tutorial for the BEAUTIFUL fabric flowers??? I'd love to teach these in my classroom! Great for a winter workshop! Keep up the great designs!